All puppies undergo an important time in their developing life between the age of 6 to 14 weeks of age when the brain develops very fast and the puppy develops its personality as well as develops fear very easily. It is very important that all puppies are well socialised to many different animals, people and circumstances. 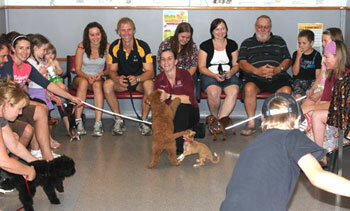 We recommend all puppies attend one of our Puppy Preschool classes so social skills can be maximised. How to book: ring 07 4153 1399 or use the form below. Why should I take my pup to Puppy Preschool? The personality of the puppy undergoes an important development between the age of 6 weeks and 12 weeks. At this stage the brain is developing very fast and the different brain cells (neurons) are connecting to other brain cells. If the neurons do not make connections then after the 12 weeks these cells will often be culled and are lost forever. Experiences that occur during this special time leave permanent influences on the way the dog acts for the rest of its life. This is the time when the dog learns to play with other dogs, this is the time when the dog learns to play with humans, this the time when fear is learnt and retains with the dog for the rest of its life. This is the period which can “make or break” a dog when it comes to interacting with the world, with other animals and with humans. This is the socialisation period that is critical for the normal development of the brain and will set the animal’s personality for life. How old should my puppy be to go to Puppy Preschool? The dog needs to be between 8 weeks and 12 weeks of age. We recommend puppies around 10 weeks start Puppy Preschool. How long does Puppy Preschool go for? The Puppy Preschool runs over 4 weeks and we hold it each Thursday night between the hours of 6 to 7 pm.